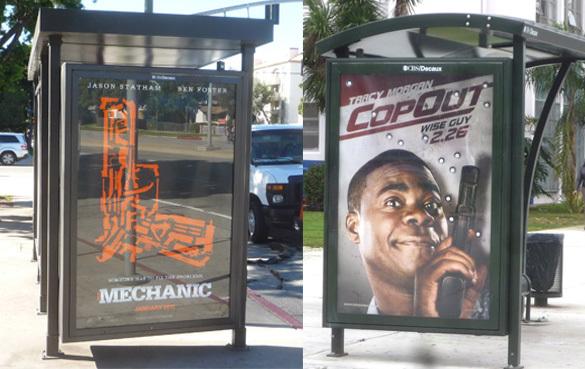 A year ago, complaints were raised about bus shelters in front of Venice High School that displayed ads for the movie “Cop Out” with depictions of an actor brandishing a gun just steps from the spot where a student was shot and killed just after classes let out three years earlier. When City Councilmember Bill Rosendahl’s office relayed these complaints to the company responsible for maintaining the shelters, the ads were removed, but memories are obviously short, because now another movie ad with a large-scale depiction of a gun has appeared one of those shelters. This is in contrast to some other cities, such as San Francisco, which bars ads that appear to promote the use of firearms or advocate any violent action. In fact, a recent movie ad depicting two persons with drawn guns was redone to remove the guns before being displayed in the city’s transit system. For an article on this story, click here. And for the inevitable reaction from the pro-gun folks, click here. The bus shelter ad in front of Venice High School, for the movie “The Mechanic”, a remake of a 1970’s Charles Bronson film about a hired assassin, depicts a large handgun that is actually formed from graphic representations of many guns, rifles, knives, grenades, and other objects of mayhem. Identifying these various weapons may give students something to do as they wait for the bus to take them home from the school. As always, a tragedy–this time the Tucson shooting of Rep. Gabrielle Giffords and others–has brought the issue of gun violence back to the public conversation. In today’s issue of Time Magazine, an article by Michael Grunwald entitled “Tuscon Tragedy: Is Gun Control a Dead Issue” presents the sobering statistic that eight children die from gun violence every day in the U.S.
On afternoons when school lets out, the bus shelters in front of Venice High School are crowded with students. Do parents want them to be looking at guns while they’re waiting for the bus?